I am frequently asked to give lectures to the graduating art students at Colleges and Universities. Choosing fine art as a career is always difficult. In America, the arts are not supported by the government as much as they are in European countries. Artists have a tough time making a living in our current economy. What do I say to these hopeful students? The reason I am requested over and over is because I am honest and provide solutions. First, I am asked to show my work. I spend about 1/4 of the time going over my most successful series, informing students about how they were executed, where they have been shown, and the reviews they have received. This is in no way to brag or show off. It is a learning lesson about the steps taken to get the work done, exhibited, and reviewed. Next, I give them the information about the art world that you don’t learn in school. This is practical information about how the gallery and museum system works, the art publications, and how important it is to attend openings. You have to be part of the art community to have your work shown. Many students believe you can be a hermit and hide in your studio cranking out work and magically get “discovered”. Not true. The most successful artists are the ones who are social. They attend museum openings, charity auctions, and participate in art world events. I provide a handout listing the most notable art galleries, museums, and critics the students should be familiar with. It also includes 10 steps necessary to launch a promising art career. During the lecture, I always have an open forum, so students can break in with questions at any point. Inevitably, someone asks “how do you make money?” I explain that there are several ways to make money other than selling your work. My income results mainly from teaching workshops & private lessons, affiliations with camera companies, jurying exhibits, and giving lectures. I encourage them to get creative and think of ways outside the traditional gallery system to show and sell their work. For instance, organizing an art show in a business park that has empty buildings. Many landlords would rather have something going on temporarily than an empty space. Joining an artist group is a smart thing to do. A conglomerate of artists have various talents, and together they can construct amazing shows. They share contacts and provide a community of friends who understand the particular challenges artists face. They deliver support that the 9-5 world does not understand. The last part of the lecture is spent on critiquing student work. This is always pleasurable. I love seeing fresh work and giving suggestions to improve it and which galleries would be most responsive. The students walk out of school armed with information to begin their careers. I hope to see their work on museum walls in the future. Posted in Fine Art, fine art photography, Lectures, Photography, Teachers. Bookmark the permalink. Hi Friends, I'm a photographer and artist who lives in Washington DC. I have two blogs. The Gina Genis Blog is about art and photography. My new blog, DC Discoveries is dedicated to showing you everything from fashion to art, food to entertainment in all sections of the District. I hope you will take the journey with me. I exhibit my work in museums and galleries across the U.S. I'm included in the permanent collections of the Sackner Archive of Concrete and Visual Poetry, the Otto G. Richter Library Special Collections Division of the University of Miami, Hard Rock Casino, Orange County Transit District, IBM, and the Sarah and Adam Markman Collection among others. 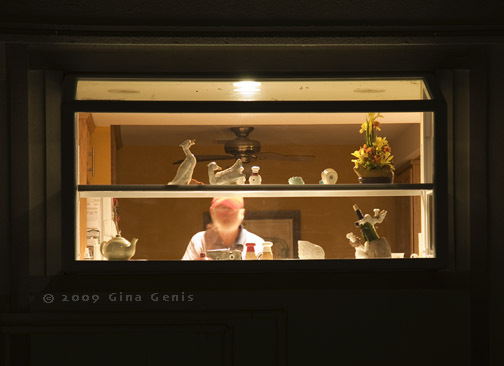 My series "Window Peeping" was included in OsCene 2010 at the Laguna Art Museum, Truman State University, Fellows of Contemporary Art, Biola University, and solo shows at Gallery 825 and Cypress College. The "June Gloom" series was exhibited in a solo show at the University of Wisconsin, Madison. The "Kala" series has been exhibited at MPLS Photo Center, Cypress College, and Gallery 825. "Economy Portraits" was created as an Artist In Residence project at the Huntington Beach Art Center, and was awarded "Best Art Show of 2011" by the OC Weekly. I curated Wide Angle View, an exhibit of 16 international, award-winning photo and multi-media journalists at the Orange County Center for Contemporary Art to much critical acclaim. Recent reviews of my work have appeared in the Huffington Post, Art Scene, OC Weekly, Orange County Register, New University, Riviera Magazine, Coast Magazine, Huntington Beach Independent, and appeared on CNN, NBC, ABC, and more. I lead the Gina Genis Photo Workshops where I show beginning and intermediate photographers how to jump to the next level with their work. I also teach online photography courses through The Compelling Image.